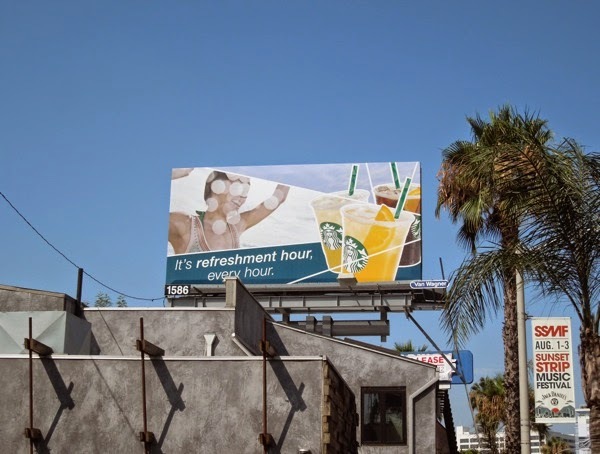 Advertising, advertising everywhere and not a drop to drink. 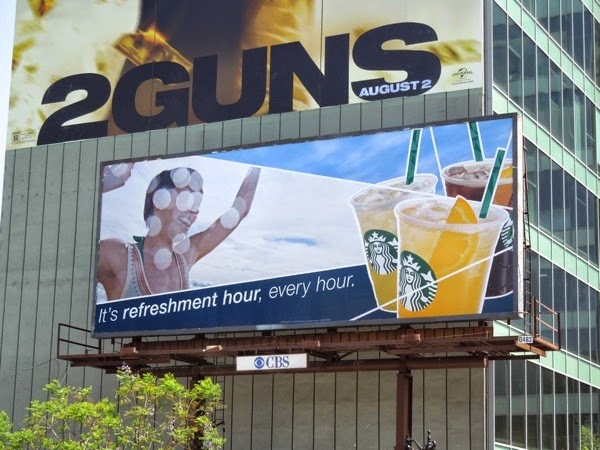 Please forgive Daily Billboard's hijacking of The Rime of the Ancient Mariner, but as Starbucks has filled the skies with an abundance of billboards for its cool new beverage offerings this Summer it suddenly came to mind. 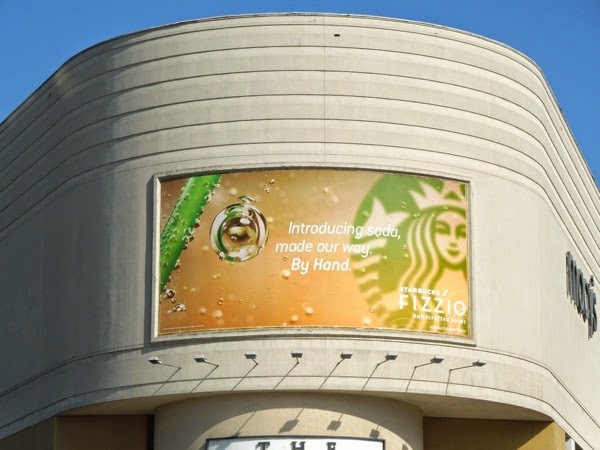 If it's too hot for your normal espresso, latte or cappuccino this season, then the brand that is synonymous with coffee wants you to try the new additions to their cold beverage portfolio, handcrafted Fizzio soda and Teavana Shaken Iced Tea. 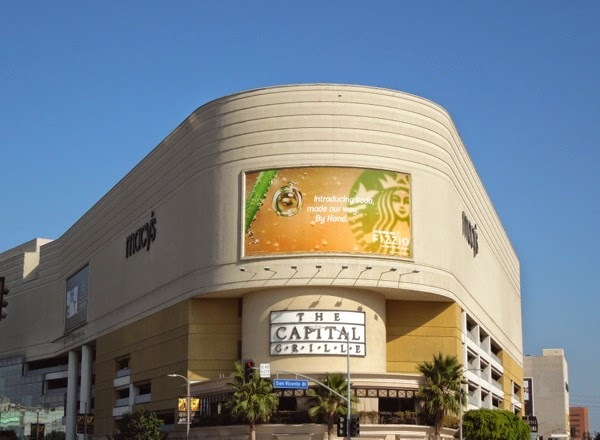 Not only that but you can also buy your favourite Starbucks Iced Coffee from your local supermarket's chiller cabinet, without waiting in line at the coffee chain's thousands of stores on your local street corner. 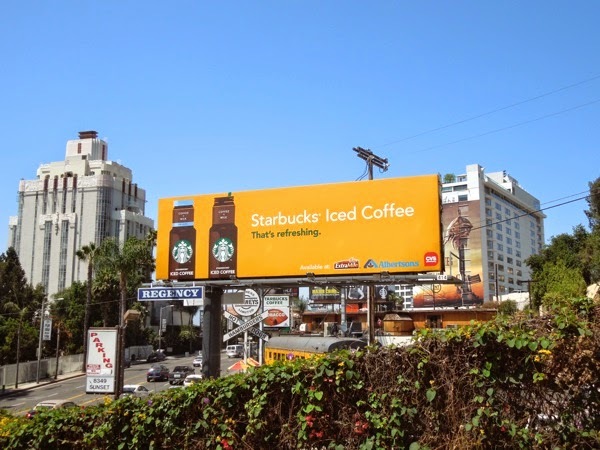 The coffee giant really is trying to tell the world, hey look, we're not just about coffee anymore - we do tea and soda too. They are even trialling wine and a wider food selection in some locations, to help extend the consumer experience beyond that morning and lunchtime rush when customers just can't survive without their caffeine. Not only that, but the Fizzio sodas are handcrafted too, which makes them sound as if they were made by artisans, rather than it being a glorified SodaStream concept. Granted the Fizzio sodas have no nasty artificial flavours, preservatives or high fructose corn syrup, but as more and more people connect the dots between obesity and soda drinks made by the likes of Coca-Cola and Pepsi, it's strange that Starbucks is shouting so loudly about going into the soda market. The sodas come in Spiced Root Beer, Golden Ginger Ale and Lemon Ale variants, but will any of them prove as popular as Starbucks seasonal Pumpkin Spice Latte? 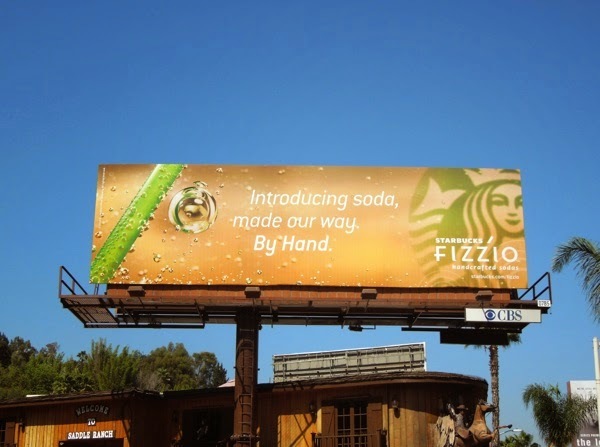 These Fizzio soda billboards were snapped along Sunset Boulevard and on the side of The Beverly Center in the last week of June 2014, whilst the Teavana Iced Tea billboards were photographed along the Sunset Strip and on the infamous shipping centre at the end of May. 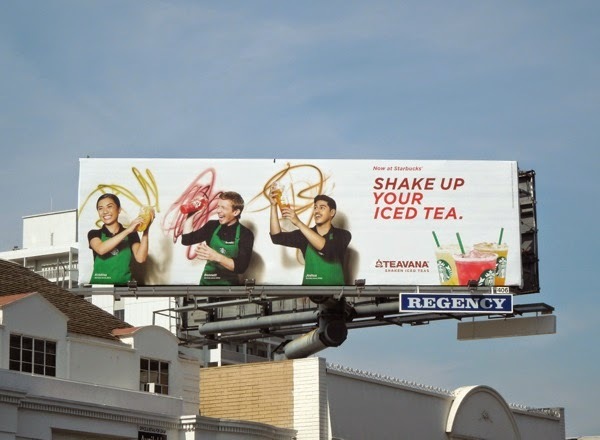 The Fizzio soda ad creatives certainly catch your eye with their bright, bubbly design and familiar Starbucks Siren logo, whilst the Shaken Iced Tea creatives featuring real Starbucks staff are a lot of fun (and look like they were as much fun to shoot). 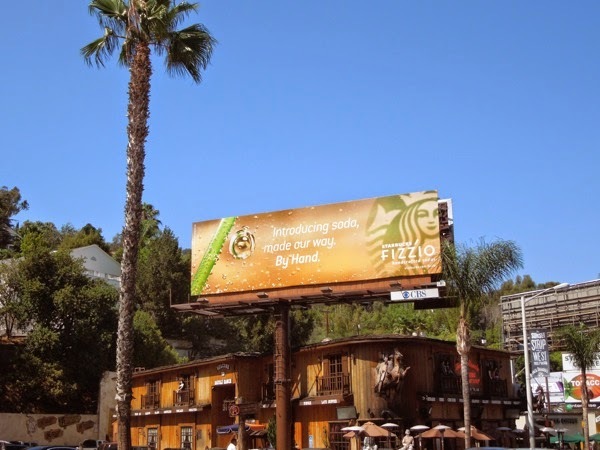 Meanwhile the plain and simple Starbucks Iced Coffee billboard was snapped on June 13, 2014, whilst the badly designed Starbucks Refreshers billboards (Daily Billboard really thought these ads looked very amateur for such a leading brand) were spotted along Highland Avenue and Sunset Boulevard last July 2013. 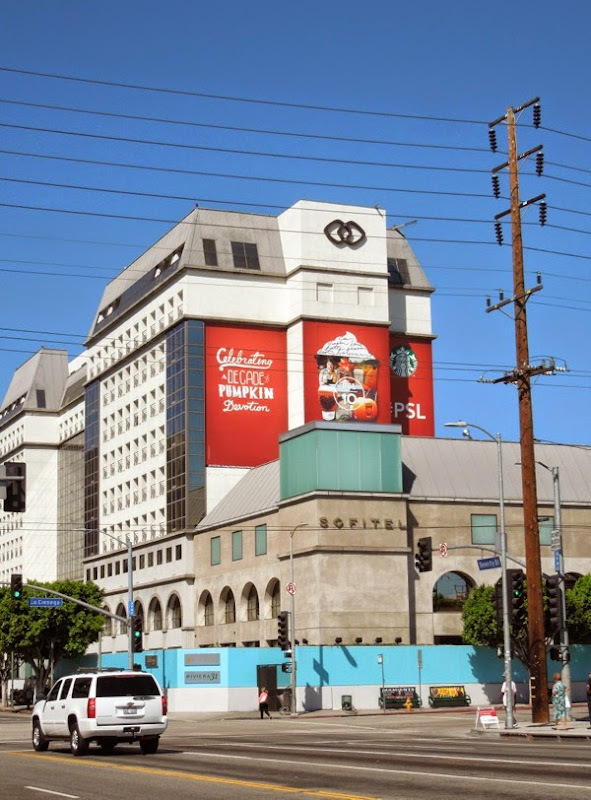 The giant-sized billboard celebrating ten years of the Starbucks Pumpkin Spice Latte was spotted on the side of the Sofitel Hotel along La Cienega Boulevard in September 2013. 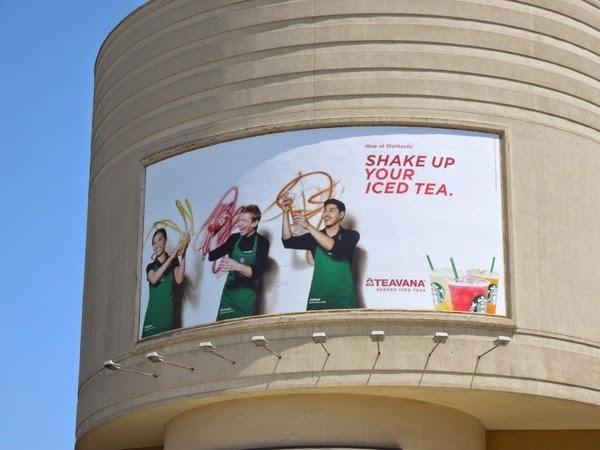 So what do you think, will Starbucks cool drinks be the hot new thing this Summer, or will they receive a chilly reception? 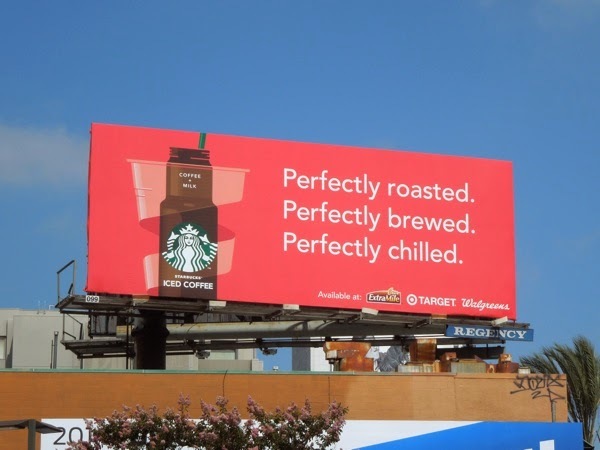 Personally Daily Billboard will be sticking to a Starbucks green tea non-fat Frappuccinno to help keep cool. 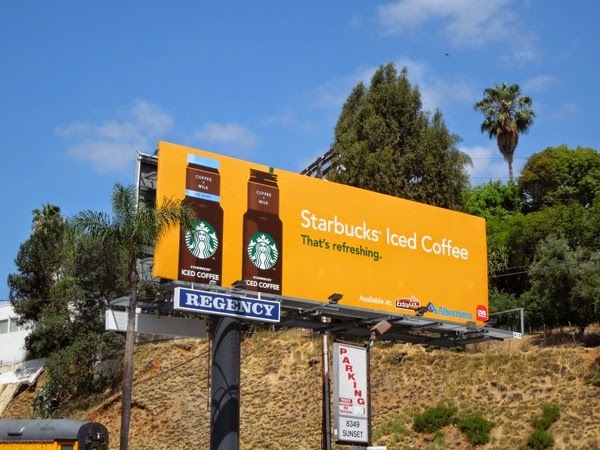 UPDATED: Here's another billboard for Starbucks Iced Coffee which you can conveniently buy at other stores and this 'perfectly' version spied along Wilshire Boulevard on July 15, 2014, has a bit more imagination than the boring creative spied along the Sunset Strip.